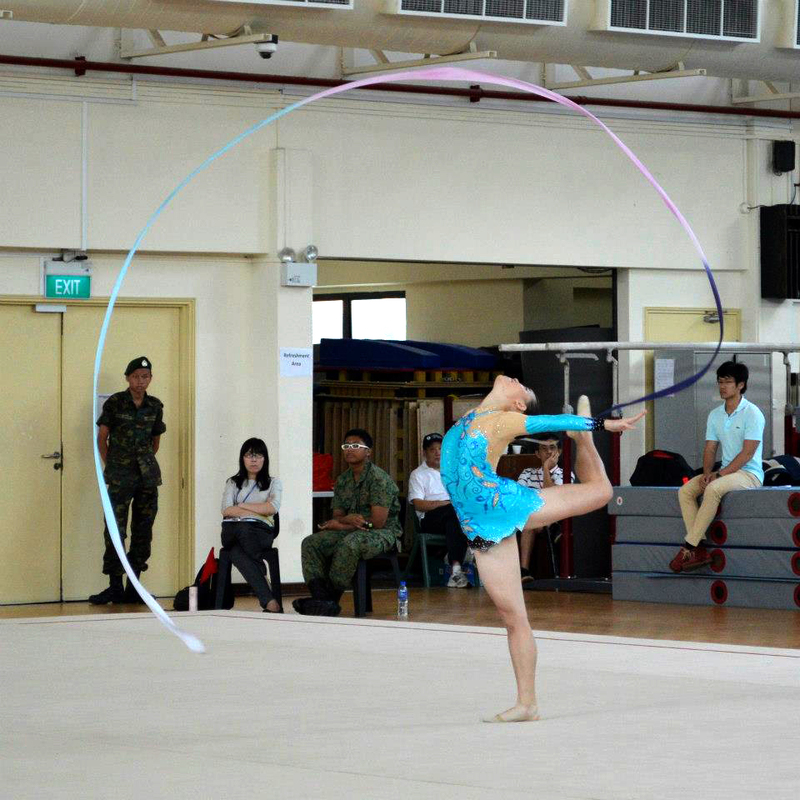 It was quite a day for the rhythmic gymnasts who took part in the National Inter-School Championships 2013 on Friday at the RI Gymnasium, many of whom were competing for the last time. In particular, Daphne Chia, Phaan Yi Lin, and Cecilia Chia swept the table by clinching the top 3 positions across all four events. For the unfamiliar, rhythmic gymnastics involves manipulating a piece of apparatus (hoop, ball, clubs, or ribbon) while performing a 90-second gym routine set to a piece of music. While the gymnasts truly astounded with their effortless execution, we were constantly reminded of how demanding the sport is by nerve-wrecking near-misses. This year, there was no team component in the ‘A’ division due to the number of competitors, but definitely no lack of the Team Raffles spirit. 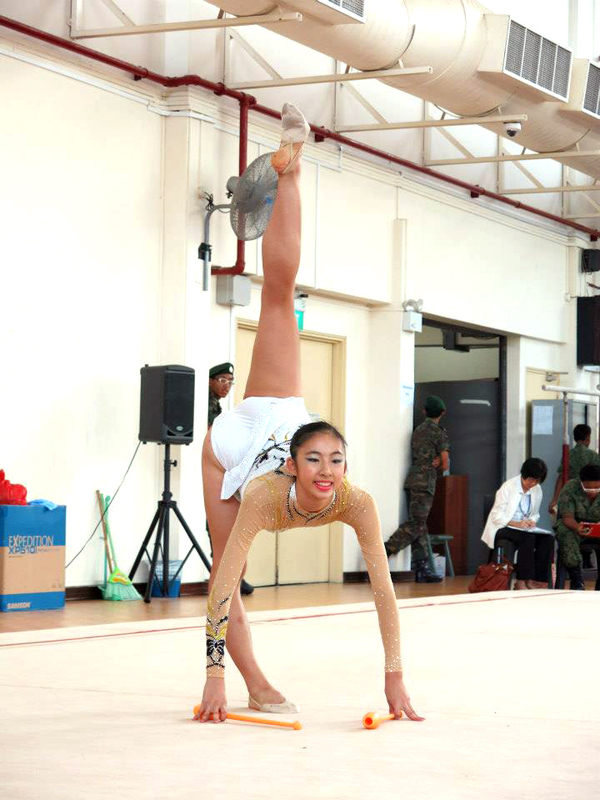 Instead of boisterous school cheers, what struck us was the affirmative applause and encouraging shoutouts from the gymnasts’ fellow CCA mates, which spurred them on to shine in their individual events. The girls fought for the top spots with other gymnasts from Catholic Junior College and St. Andrew’s Junior College, and they did not disappoint. 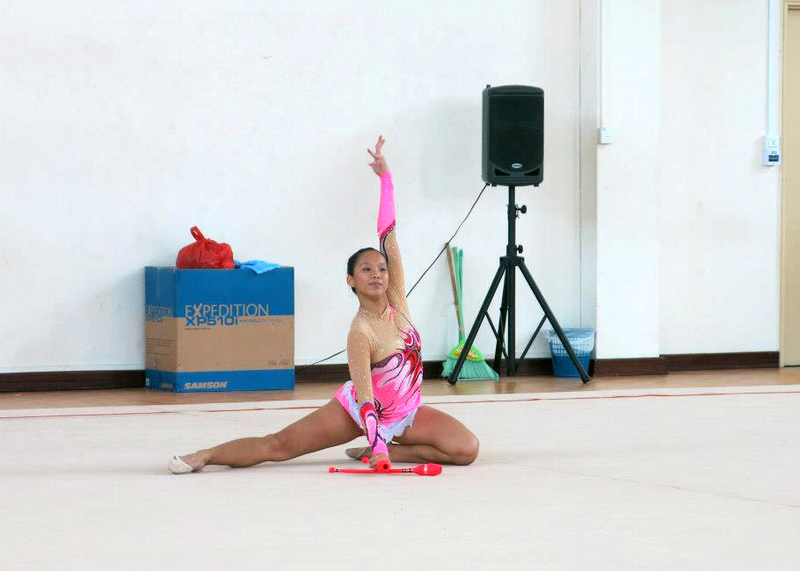 Daphne wowed the judges with her clean poses and smooth execution, particularly her clubs routine. Set to latin-style music, this piece was especially impressive with Daphne’s keen sense of rhythm and her incorporation of dance moves alongside difficult throws and spins. Yi Lin appeared confident and poised throughout all her sets, smiling as she pulled off tricky maneuvers one after another, and her energetic ball routine to the Bond theme song ended with a perfect finish. 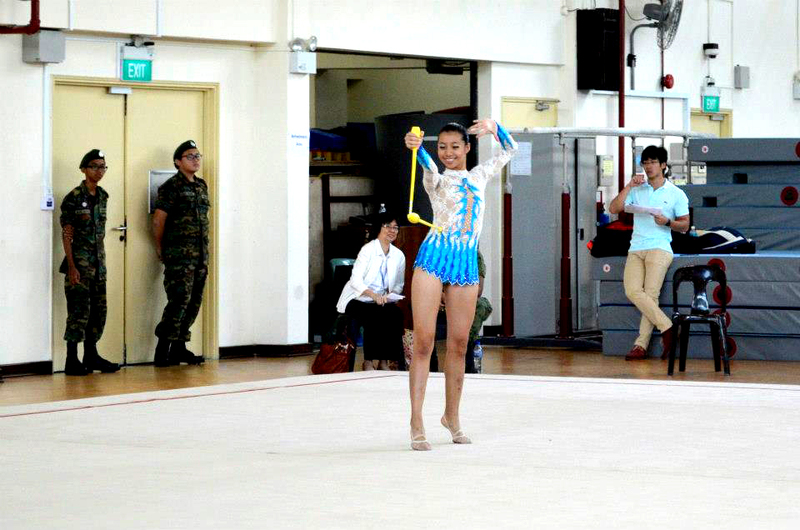 Wei Lin made an excellent second turn in her routine, twirling her ribbon with grace. Cecilia dazzled in her sparkly pink costume, performing her hoop routine to an upbeat tune, while Carrissa captivated the audience with her sky-high clubs, finishing her routine with flair. Once the competition segment ended, all the gymnasts were anticipating was the prize presentation ceremony, where they were presented with their medals. Their coach Ms Shen commented that the overall performance was ‘not bad’, considering the fact that some of these girls had only picked up the sport since joining RI. Since gymnasts tend to train from a young age, to achieve this standard of performance within a year was no mean feat. The teacher-in-charge Mr Tan echoed similar sentiments. Sister school Raffles Girls’ School swept the finals as well, clinching 1st place for the B Division Group Event and Divisional Championship with a total of 110.989 points, a significant lead of 8.948 points ahead of the runners-up. A year's worth of blood, sweat and tears has finally summed up to these past four days of the National Inter-schools Canoeing Competition. Over the past week, the Raffles Canoe team put up a strong fight against powerhouses from other schools, with a T1 boat, 2 K2 boats and 2 C1 boats making though to straight finals.